Ahhh, music to my ears… not because I enjoy seeing my patients frustrated, but rather because comments like these mean that they recognize the problem with typical hospital menus. The SAD1 state of hospital menus with their focus on low-fat options is a universal problem and has been ignored for too long. Hospitals meet the challenge when catering to special diets such as low-salt, lactose-free, gluten-free, and any food allergies, but fall short when it comes to providing low-carb options. For individuals with medical problems that are sensitive to carbohydrate intake (e.g. obesity, diabetes), ordering food in a hospital will inevitably be a frustrating experience. However, in the event that someone who wishes to eat low carb is hospitalized and subjected to archaic dietary orders and a poorly-crafted menu, there are strategies to make the best of the situation and to improve the quality of one’s meals. Though primarily directed at individuals with diabetes in the hospital setting, the principles behind these strategies are applicable to anyone who desires to eat low carb in the hospital when faced with limited food options. As unappetizing as hospital food may be, it doesn’t need to be dangerous. Why, then, do hospitals give high-carb meals to patients who physiologically cannot tolerate carbohydrates (those with diabetes)? I understand that there are numerous forces at play – dietary guidelines, patient satisfaction, ease of food preparation, cost of food, etc. – but that doesn’t excuse the deplorable food options available to those in most need of quality nutrition. In our Band-Aid culture of healthcare (treating the symptoms, not the cause), healthcare organizations continue to underperform with their short-sighted approaches to patient care, concerned more about short-term cost-saving strategies than the more substantial, long-term benefits of real, unprocessed food. This short-sighted approach in healthcare is unacceptable, especially as I and other like-minded physicians struggle on the front line to provide the best care possible to patients who are already victims of decades of politics, marketing, and bad science. Perhaps the most common diet ordered for diabetic patients in the hospital is the “Consistent Carbohydrate” diet that allows 60 grams of carbohydrates per meal, encouraging patients to consume relatively the same amount of carbohydrates during each of their three meals per day. The diet order usually also allows for 1-2 snacks per day containing up to 15 grams of carbohydrates. Sadly, that means that a diabetic patient in the hospital could consume 210 grams of carbohydrates (comprised of sugar) daily. The rationale for this “Consistent Carbohydrate” diet is that it is easier (and safer) to dose insulin to match the amount of carbohydrates ingested when the amount of carbs is relatively constant throughout the day. In contrast, a variable amount of carbohydrates consumed throughout the day requires a varying dose of insulin, which makes it more difficult to achieve good glycemic control and also increases the risk of hypoglycemia (low glucose), a risk of receiving too much insulin. Although the term “ADA diet” has never been clearly defined, in the past it has usually meant a physician-determined calorie level with a specified percentage of carbohydrate, protein, and fat based on the exchange lists. It is recommended that the term “ADA diet” no longer be used, since the ADA no longer endorses any single meal plan or specified percentages of macronutrients as it has done in the past. The damage is done, however, as their influence lives on in hospitals everywhere that continue to subscribe to this outdated, high-carbohydrate dietary approach to managing diabetes, such that any reference to a “Diabetic Diet” or “ADA Diet” typically defaults to the “Consistent Carbohydrate” Diet allowing (and even encouraging) 60 grams of carbohydrates per meal. What can you do then if you want to eat low carb in the hospital? If there is not a well-designed low-carb menu available, you may employ the following strategies to improve your dietary intake when your health is on the line. Current nutrition recommendations advise individualization based on treatment goals, physiological parameters, and medication use. Diabetes self-management in the hospital may be appropriate for select youth and adult patients. Candidates include patients who successfully conduct self-management of diabetes at home, have the cognitive and physical skills needed to successfully self-administer insulin, and perform self-monitoring of blood glucose . . . have adequate oral intake, be proficient in carbohydrate estimation . . . The ADA has paved the way for you to manage your own diabetes. Ask your doctor for permission to do so. Also beware the “Cardiac Diet” – the lazy physicians’ default diet order for anyone they perceive to be at risk for cardiovascular disease. It is low fat, low saturated fat, low sodium, and painfully unappetizing. The so-called “evidence” for this dietary approach has been refuted many times over, but this low-fat dogma remains ingrained in health care. 2. Mix and match. Select the best low-carb meal available to you with quality sources of protein and fat – meat, fish, vegetables, and full-fat dairy. Then, if needed, scan the menu and select any low-carb elements of other menu items to create your own low-carb meal. Do not feel trapped by the pre-determined meals on the menu. If you see an ingredient that you would like that comes with a different meal, ask to swap, add, hold, or whatever is necessary to create a better low-carb meal. For example, you may need to ask the kitchen to hold high-carb portions of the meal (“May I have a hamburger without the bun?”) or request specific ingredients that may be part of other dishes (“May I have the scrambled eggs and onions that are part of the breakfast burrito along with the ham from the Eggs Benedict?”) Get creative. 3. Pick Sides. There are often several a la carte items available on the menu that may complement other menu items, or perhaps a few a la carte items together will make a reasonable meal. For example: hard-boiled eggs and a side of bacon/sausage; chicken breast and a side of non-starchy vegetables. 4. Request a general diet. Especially if there are limitations on your diet order, ask for an unrestricted (e.g. general) diet. A “general” diet may allow you the flexibility to order multiple menu items and then eat only the low-carb ingredients. If the cafeteria won’t hold the high-carb items, simply set them aside. It’s not “wasting food” if it wasn’t real food to begin with. 5. Beware of fillers/binders. A dirty secret among some restaurants is to mix cheap ingredients in with higher quality ingredients. For example, some restaurants/kitchens add pancake batter to their scrambled eggs – the eggs go further and will have a fluffier texture. Not only is this a cost-saving measure, but also the eggs are more appealing to the customers. To avoid this hazard, request that your egg[s] be boiled, fried, or poached. Meatloaf and meatballs are frequently prepared with bread crumbs as a binding agent to keep them from falling apart, and many sauces contain thickeners such as flour or corn starch. Ask about ingredients when you are ordering. 7. Bring in food from outside the hospital. You may need to request permission from your treatment team to allow outside food brought in to you if you are on a restricted diet, whether by friends/family or by delivery. If you know that you will be hospitalized (e.g. an elective surgery), bring your own supply of food that is easy to transport and will not spoil. Note that the limitations of a restricted diet still apply to food brought into the hospital, and thus the content of the food needs to be compatible with the ordered diet. A good selling point for this approach is that this option actually benefits the hospital, in terms of reduced costs of food and labor. 8. Keep your own record of meals/glucoses. Perhaps the greatest (yet most under-utilized) tool at your disposal is the glucose meter or, better yet, a continuous glucose meter. Check and record your glucose immediately before your meal, and then repeat a glucose measurement 60-90 minutes after your meal (You’ll have to either request this post-meal glucose or do it yourself – it is not routinely performed). Monitoring how your glucose is affected by the food you eat is a powerful tool in managing diabetes. Use this knowledge to select food that causes little to no increase in your glucose, and avoid the foods that increase your glucose. This method of monitoring may also be the only way you will know if there were any “secret” ingredients mixed in your food (see #5). 9. Skipping meals/fasting. There are many situations in the hospital that require NPO (“nothing by mouth”) status, most commonly surgical procedures, some radiologic studies, and as part of the treatment plan for certain medical conditions (e.g. acute pancreatitis). Though many people act as if they’ll die from missing just one meal (I am constantly on the receiving end of “Hangry” patients), fasting (specifically intermittent fasting, not extended fasting) can be a very useful (and appropriate) metabolic tool, even for those who are sick enough to land in a hospital. Hospitals certainly subscribe to the arbitrary convention of 3 meals per day, but that doesn’t mean that you need to. That said, if you are hospitalized for an acute illness, ensure that you are getting adequate nutritional intake; you can address your long-term metabolic derangements later. Obviously, fasting is not recommended if one is diagnosed with underweight or malnutrition. 10. Voice your opinions to administration. If your care team simply does not make an effort to accommodate your nutritional needs, it may be necessary to get administration involved, whether that’s a nursing supervisor or other position of authority available in-hospital. There may also be a patient advocate available to assist you through a conflict. Though these measures should be required only in rare situations, I encourage widespread use of non-urgent feedback to hospital administrators about the quality and availability of low carb food options. This feedback may take the form of a survey or, better yet, a well-written letter. If the problem is not called to their attention, there is no chance of convincing administration to improve the food options. Don’t forget to point out the positives as well as the negatives. It means a lot when you offer praise for hospital employees who provide exceptional care. Caution: Do not threaten anyone with legal action. You may encounter advice recommending this course of action when one doesn’t get his/her way with food in the hospital. This approach is flawed due to the following: 1) You have no case. Hospitals have the dietary guidelines on their side, and their diabetic diets do not constitute a deviation from the standard of care. 2) It may negatively impact your care, even if only in subtle ways. Healthcare personnel are far too familiar with inflamed and entitled patients threatening legal action if they don’t get their way. Be civil and respectful – that will go a long way towards getting the type of care you want. It’s bad enough that being hospitalized may be unexpected and unpleasant; you may also feel that you have lost your independence with basic activities, including eating. Hospitals (and healthcare, in general) may be lagging far behind the science when it comes to nutrition, but you may employ the abovementioned strategies to regain a sense of control and secure better food offerings for yourself when proper nutrition should be a priority. American hospitals clearly have far wider choices than Australian ones. My last three surgical admissions, i couldnt get a protein based breakfast any more (only oatmeal, packaged cereal, toast, fruit in syrup, sugared yoghurt and juice). Number 10 doesnt work. 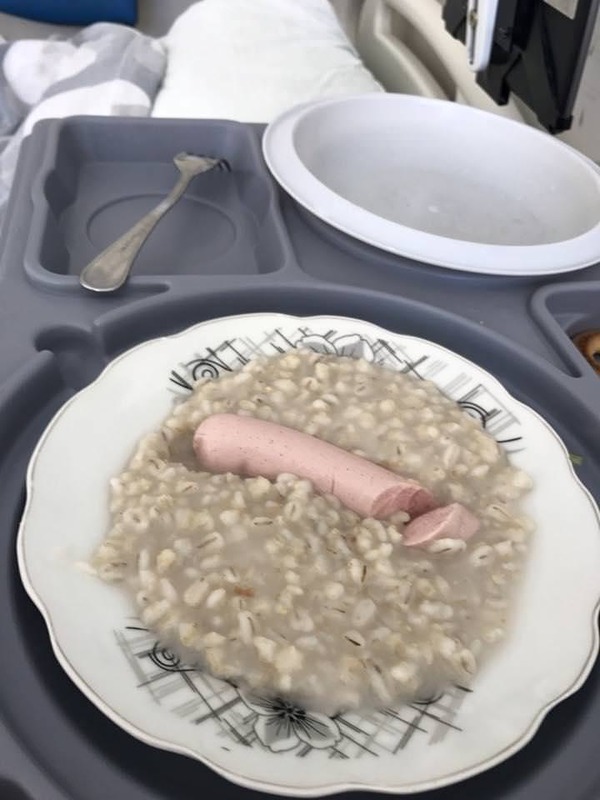 Hospitals dont care what they feed you or what you think of it as their priority is to get you through and out before your clinical malnutrition manifests. Number 7 might work but, as a rural patient, getting someone to bring me food is nigh impossible with family several hours drive away. I keep cheese, butter and nuts in the bedside locker and otherwise fall back on Number 9. Dont eat their crap and get out of there as fast as you can. Wondering if there is an alternative to glucose intravenous? This could be pretty bad for a diabetic, right? Glucose intravenous is EXTREMELY effective and works absolutely fine. It would be WAY worse for someone like myself with type 1 diabetes... or for someone with type 2 diabetes if the hospital didn't give the person with diabetes a glucose IV. If your husband was actually able to control his type 2 diabetes without any insulin at all....they would never give him insulin. Instead work with the doctors and with your husband. Because by him eating sugar free and eating protein, fruits, vegetables and moderate carbs will help keep blood sugars under control. That will help him avoid having to go to the hospital as much. So will both you and your husband learning how to correctly monitor blood sugar. It's well-worth learning, taking action about and doing. Having diabetes means you just balance your carbs correctly and that reduces problems. Also, politely ask questions and listen to and do things the doctors say to do. Hospitals are horrible for providing food to allergic patients. Doesn't matter the allergy. I remember being stuck in hospital for 3 days after having my second child and having nothing but jell-o, because food services couldn't NOT provide for lactose intolerance, and would not allow me to "self-medicate" with Lactaid. So they had nothing else to feed me. I ended up ordering food in, which was much healthier than what the hospital was capable of providing. Ugh. My mother was given insulin on three separate hospitalizations in different hospitals in spite of the fact that she was not diabetic. She would immediately crash, and they would panic. I even wrote it on the board in large letters, NOT DIABETIC, but she would invariably start getting trays loaded with carbs and the telltale sugar free jello and artificial sweeteners. I would ask one of her doctors, nurses, etc why she was getting the diabetic diet. They would say, "Because of the diabetes." She doesn't have diabetes was my reply, and they were always surprised. Evidently kidney problems and blindness combined with obesity equals diabetes regardless of land to the contrary. People make assumptions and mistakes. Your judgy accusatory response, Jennifer, demonstrates your faith in healthcare system that kills people. Especially people who don't ask questions and advocate for their own care. Dr. Bernstein warns against glucose IV. I think he suggests a salt based drip instead. Recently, my wife had an operation and was hospitalized over night. We asked for, and she got Ringer's instead of glucose IV. She had to continuously reject carby food, like crackers. Negotiated bacon and eggs for breakfast. She wanted some real butter to go with the breakfast but all they serve is margarine (??!!) And I brought in BPC for her breakfast too. Because by him eating sugar free and eating protein, fruits, vegetables and moderate carbs will help keep blood sugars under control." "Also, politely ask questions and listen to and do things the doctors say to do. Wait a second. The diet objective of this site is carb minimization. Deb did not want "fruits and moderate carbs" for her husband, she wanted low carbs. Minimizing carbs can have ONLY a positive effect in blood sugar management. For breakfast, the hospital staff could have brought Deb's husband a double portion of eggs and bacon to satisfy his hunger instead of the carbs and it ironically may have netted out with fewer calories while certainly resulting in lower blood sugar afterwards. What's wrong with that? Hospitals charge a few thousand bucks a day for a room. They can afford to meet trivial meal requests associated with a legitimate health care rationale. I have type 2 diabetes and when I had knee replacement surgery my blood sugars were under pretty good control using LCHF and Metformin. I was concerned about the food options I would be offered, but found that the staff were pretty amenable to my suggestions. When I called to order a dinner, for instance, I asked for the meat and extra vegetables with butter. The person taking my order asked if I wouldn't like to include a carbohydrate with my meal, but accepted that I was eating low carb. I was pleasantly surprised by their acceptance of my dietary choices, especially given the stories I'd heard to the contrary. Hopefully, more and more hospitals will understand that not everyone can fit into the Standard mold! My last hospital stay - overnight only because I did not have a ride home after an endoscopy - they prescribed insulin for me though I have never been on it [I refused to take it] and brought me a "diabetic lo=carb" dinner including instant mashed potatoes with hospital gravy, breaded chicken patty, slice of white bread and grape juice...with cookies for dessert. I thought they had lost their minds. I was not given a menu to choose from. I'm terrified of ending up in one of these horror shops in an unconscious state with no one to advocate on my behalf. A few month , in a Canadian Hospital, while scrolling through an inpatient record I came across an active order for Ketogenic diet . I was over joyed so see those two little words written under the diet order . My husband and I began a low carb diet almost 5 years ago in response to him being diagnosed with Type 2 diabetes (HbA1c at diagnosis was 12.6) Our low carb diet allowed him to quickly get off of ALL diabetes medications and he has maintained his HbA1C levels at normal levels (5.4 to 5.6) without medication for more than 4 years. Two years ago, he had to go into the hospital for surgery to replace a leaking heart-valve (due to a congenital defect that we'd known for 30 years would eventually have to be repaired). Despite all our explanations about low carb and pleading, he was placed on a "heart-healthy low-fat" diet... which meant meals with tons of carbohydrates! On the heart-healthy low-fat diet, he could order sugary cereal and pancakes and toast and orange juice for breakfast but was not allowed real eggs... not even hard-boiled! Hubby had his first post-surgery meal (selected from among the least carby options available on his menu) and his blood sugar immediately shot up to over 200... A number he hadn't seen in four years of daily BG testing. Of course, he was given an insulin injection....which resulted in a BG drop into the 60s....so that followed by a glass of orange juice to combat the hypoglycemia! The roller coaster ride was on. And of course the hospitalist immediately prescribed metformin plus another diabete's med (I forget the name) to "get your diabetes under control." At that point, rather than arguing any further, hubby simply ordered his "low fat" (high carb) meals from the cafeteria and, when the nurses weren't looking, I'd carry those meals out and dump them into a trash can! Instead of eating what the protocols said he should, I snuck low-carb foods into his room for him. Bacon, hard boiled eggs, full-fat soups, lettuce wrapped burgers, etc. If anyone came in while he was eating, I simply pretended the food was mine. And to avoid taking the diabetes meds the hospitalist had prescribed, hubby palmed them when the nurse brought them round. Once we decided we simply weren't going to "comply" with the heart-healthy dietary regimen anymore, hubby's BG stayed stable with postprandial readings never going above 140. So no more insulin and no more roller coaster. On the day he checked out, the hospitalist came by for a final visit, which included congratulating hubby on how quickly he seemed to be recovering from the surgery. However, the hospitalist also wrote him scripts to fill for a 30 day supply of metformin and the other diabete's med and told him that he needed to his primary care physician immediately about his diabetes. At that point we confessed what we had been doing and showed the hospitalist the pills that hubby had been given but had NOT taken. Rather than being the least bit intrigued by the incontrovertible FACT that my husband had clearly controlled his diabetes by NOT FOLLOWING standard hospital protocols for diabetics, and that following a low-carb diet had apparently had no negative impact on his recovery from heart surgery, the hospitalist stormed out in an absolute fury! While your suggestions for getting a low carb diet while in the hospital are fine, one cannot count on them working. In the U.S. at least, patients have a legal right to refuse to accept given treatment although the doctor can then refuse to continue to treat the patient at all. So, for example, my husband could have refused the insulin shot and had made up his mind that he would refuse any additional insulin doses even if his blood sugar temporarily went above the magic 150 number. IMHO, patients ought to equally have the right to refuse to accept placement on ANY particular dietary protocol (such as the ubiquitous low-fat heart-diet) but it doesn't seem to work that way. The cafeterias won't even deliver a meal to your room until your doctor tell them what dietary protocol he has prescribed! And you can't force your doctor to proscribe a "general" diet so that you can choose among all the cafeteria's offerings. Unless and until protocols change - which will likely only happen if the USDA ever wakes up regarding it's "dietary recommendations" - in my opinion, anyone who controls diabetes with diet, or who follows a low carb or ketogenic diet for any other health related reason NEEDS to make sure they have a good friend or family member accompany them if they go to a hospital. And the friend/family member needs to be prepared to assist the patient in bypassing outdated dietary restrictions. Jennifer, I know this post is from a year ago, but I did want to point out that Deb stated her husband was not on an insulin regimen prior to hospitalization, furthermore, he was on steroids. Google steroidal effect on blood glucose levels.